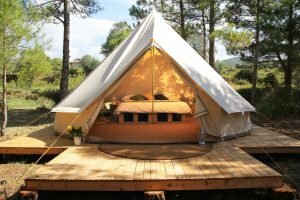 When it comes to choosing between the glamping tipi or the basic tent, there are many factors to consider. 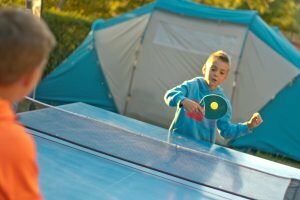 Some of them—cost, convenience, and comfort—are easily qualified, but there are many other details that will likely be overlooked by the casual camper. When most people think of tent camping, they visualize a small structure made of synthetic plastic, usually in either a dome or a triangle (“pup”) shape, supported by flimsy poles. With the advent of glamping, that’s no longer the standard—nor should it be, when you take an in-depth look at everything the larger cotton models have to offer. Read on for an in-depth look at the strengths and weaknesses of each choice. There’s no doubt that the tipi tent provides a more restful night’s sleep and a better overall experience in this department. While the basic tents might be seen as more traditional and romantic, such novelty wears off after a few nights sleeping on the ground with only minimal cushioning to separate the body from the roots and rocks. Tipi tents are outfitted with mattresses (some with actual bed frames), as well as basic furnishings and lighting features. They offer an opportunity to reconnect with nature, without sacrificing the basic comforts. In this department, the glamping tipi is the clear winner. Synthetic plastics trap moisture particles inside the tent, keeping the interior warmer—and sometimes stuffy. The cotton of the glamping tipis, on the other hand, allows these same particles to escape, which provides better ventilation. While the basic tents do have small vents to allow breathability, they’re often blocked by rain flys or equipment. Meanwhile, the tipi tents contain multiple mesh-covered vents and windows, making them the better choice when it comes to ventilation. There’s no question that the glamping tipi is more convenient than a basic tent. In addition to the comfort factors listed above, this choice also translates into less need for bulky equipment, which makes packing and unpacking a breeze—the vacation can begin as soon as you set foot inside your accommodation. The science behind this one is interesting, as most outdoor enthusiasts are aware that cotton should never be worn on hiking or boating excursions due to the fact that it leeches away body heat when wet. However, the cotton fabric of the tipi tents will actually provide better protection on rainy nights. Why? Because the cotton fibers will expand when wet, keeping the moisture from entering the tent. The plastic of the basic tents, on the other hand, will repel water at first but hold that moisture once saturated, further limiting ventilation and causing the interior of the tent to feel damp. If rain is in the forecast, it’s wiser to go with the glamping tipi. Cotton is the clear victor: It’s tough, rip-resistant, and easily repaired when damaged. The tipi tents are also stronger and more durable in their overall construction, meaning they’ll hold up to the wind and weather—even blowing snow. The basic tents are supported only by thin poles, and the fabric is easily damaged and nearly impossible to repair. While this might come in handy for keeping the price points low(see “Cost” below), when it comes to security and peace of mind, the glamping tipis can’t be beat. In this department, the basic tent comes out on top. The comfort and elegance of the glamping tipis doesn’t come cheaply, and those seeking a more minimalist experience will be perfectly happy with the more traditional synthetic tents. Our offerings are roomier than most, with a large common area flanked by two separate compartments for sleeping. The burning of camp stoves is not recommended in basic tents—the plastic will melt, posing a health hazard as well as ruining the fabric. Cotton, meanwhile, is able to withstand the heat of a camp stove—even a wood-burning one. This adds immeasurably to the allure of the glamping tipi. Because of the heat-retention factor, synthetic tents don’t hold up well in the bright sunlight. The interior of the basic tents can get uncomfortably stifling on hot and sunny days—something the glamping tipis manage to avoid, thanks to their superior ventilation systems and the cotton used in their construction. They’re also better able to withstand sun damage, which makes them a better investment in the long run. The basic tents’ slow degradation over long days in the sun makes the glamping tipi the obvious winner of this round. The charm of a basic tent is undeniable, but it dwarfs in comparison to the glamping tipi. There’s a reason why such structures have been favored for so long: They’re impressive and stately, as well as strong and practical. And that’s just the outside; take one look at the interior of these well-appointed structures, and you may never want to leave. With victories in all but one category, the glamping tipi is the clear choice. Reserve yours today to begin creating memories that will last a lifetime.